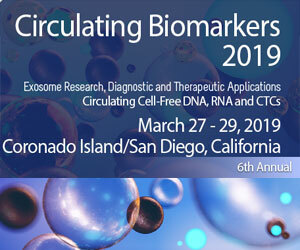 Various methods for isolation of exosomes from biological fluids have been developed. They include centrifugation, chromatography, filtration, polymer-based precipitation and immunological separation. Recent technical improvements in these methods have made the isolation process faster and easier. 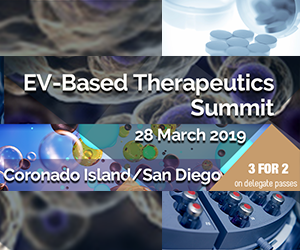 Contamination of isolated exosome with non-exosomal particles can cause wrong conclusions about biological activities of obtained exosomes and therefore should be avoided. 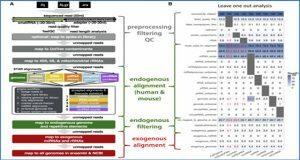 Exosomes from different specimens can possess different protein/lipid and luminal contents and different sedimentation characteristics. Differential centrifugation The method consists of several centrifugation steps aiming to remove cells, large vesicles and debris and precipitate exosomes. Differential centrifugation is the standard and very common method used to isolate exosomes from biological fluids and media. The efficiency of the method is lower when viscous biological fluids such as plasma and serum are used for analysis. Density gradient centrifugation This method combines ultracentrifugation with sucrose density gradient. 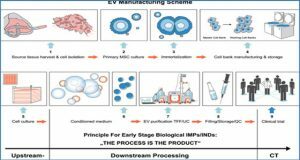 The method allows separation of the low-density exosomes from other vesicles, particles and contaminants. Very high sensitivity to the centrifugation time. Size exclusion chromatography Size-exclusion chromatography separates macromolecules on the base of their size. It applies a column packed with porous polymeric beads. The method allows precise separation of large and small molecules and application of various solutions. 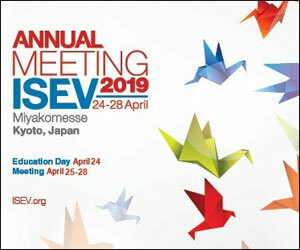 Compared to centrifugation methods, the structure of exosomes isolated by chromatography is not affected by shearing force. The method requires a long running time, which limits applications of chromatographical isolation for processing multiple biological samples. 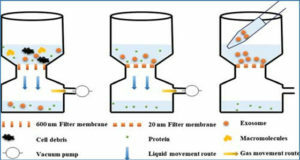 Filtration Ultrafiltration membranes are used to separate exosomes from proteins and other macromolecules. The exosomal population is concentrated on the membrane. Filtration allows separation of small particles and soluble molecules from exosomes. During the process the exosomal population is concentrated by the filtration membrane. 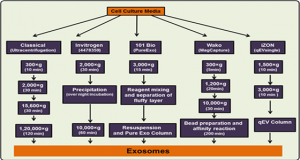 Exosomes can adhere to the filtration membranes and become lost for the following analysis. Also, since the additional force is applied to pass the analyzed liquid through the membranes, the exosomes can potentially be deformed or damaged. Polymer-based precipitation The technique includes mixing the biological fluid with polymer-containing precipitation solution, incubation step and centrifugation at low speed. The advantages of precipitation include the mild effect on isolated exosomes and usage of neutral pH. 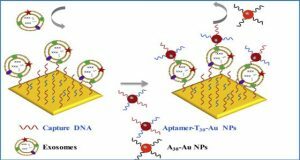 Polymer-based precipitation methods co-isolate non-vesicular contaminants, including lipoproteins. Also, the presence of the polymer material may not be compatible with down-stream analysis. Immunological separation Various immunological methods are applied. 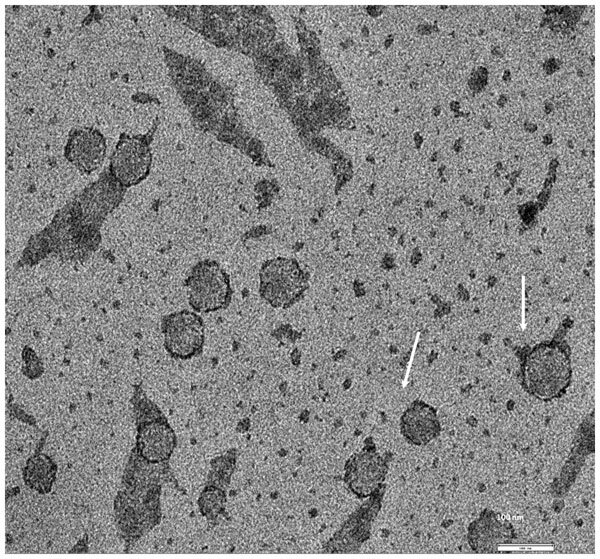 Magnetic beads bound to the specific antibodies are used to isolate exosomes. Also, ELISA-based separation method was developed. 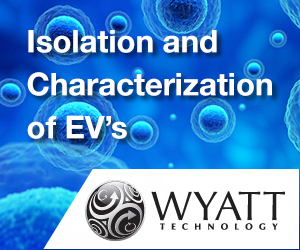 The method allows isolation of all exosomes or selective subtypes of exosomes. Also, it may be applied for characterization and quantitation of exosomal proteins. The method is not applicable for large sample volumes. 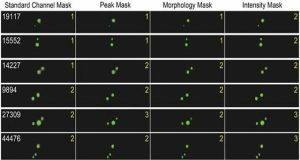 Also, the isolated vesicles may lose the functional activity. Isolation by sieving This technique isolates exosomes by sieving them via a membrane and performing filtration by pressure or electrophoresis. Relatively short separation time and gives high purity of isolated exosomes. 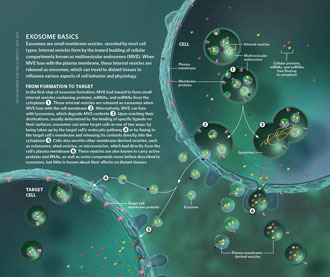 Low recovery of isolated exosomes.